When you are shopping for something fancy to wear for all the events during this Holiday season, you don't have to shop at the most expensive stores or even hit the malls. Believe it or not Target has a lot of dressy pieces right now. My entire outfit (minus the tights) is from there. The Velvet, Crystal-Embossed Blush Booties are from the Who What Wear collection are some of the gorgeous shoes I mentioned about in my Who What Wear Wants while this new Chiffon Maroon+Blush Floral Midi Dress with Cut-Out Long Sleeves is by Xhilaration at Target and my Black+Smoke Grey Stud Earrings are by Sugarfix from Bauble Bar - they come in a set of two and they are beautiful. 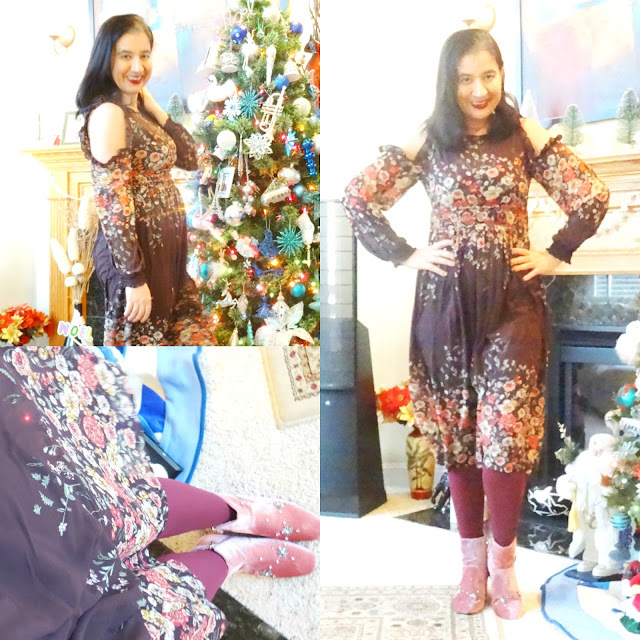 I love how this outfit came together because even-though I am wearing Maroon, Blush Pink and Burgundy, it is still pretty monochromatic. I even wore some Wine Lipstick. I love a good dark red lip for the Holiday season. 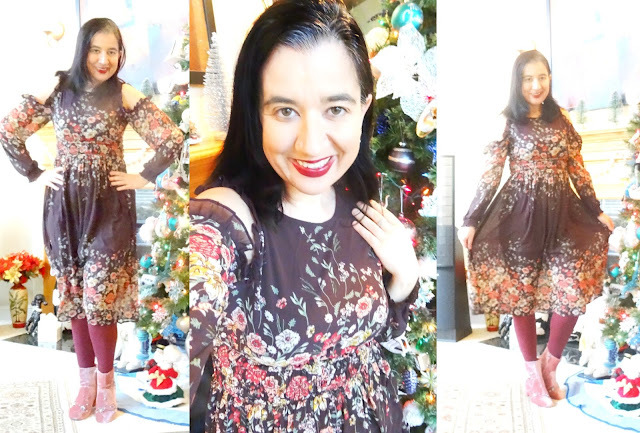 I purchased a long-sleeve cold-shoulder, dark-colored floral dress last Winter to wear during the Winter (short with bell sleeves and hi-lo sides) but I hated it on me and only wore it once. Now this dress by Xhilaration (Target's junior) line is so pretty and chic and perfect for a mom. I believe it is perfect for the Holidays and for Fall and Winter, but I can see it be worn for every season. I love it paired with the burgundy tights and blush pink booties because it brings out EVERY color of the dress. The midi length is great too and the high waist makes it perfect for an expecting mama, too. I cannot find my dress online but it is current on the stores. The one I linked on the widget is very similar. Target has other pretty-for-Holidays cold-shoulder dresses though like this LBD, this burgundy one with a pussycat bow - my favorite or this wine cocktail dress with laceup neckline - perfect for a Holiday Party. For reference my own dress I have on is a size Small. For Makeup as you can tell I glammed it up. A clean face with a very light grey+beige eye shadow, mascara of course, some blush and the icing on the cake - a Dark Red Lipstick which is perfect with this Holiday Look. It is the Charlotte Audacious Lipstick by Nars - a new lipstick which is becoming a favorite. I kept the jewelry simple too and with the exception of my wedding ring, I only wore these Sparkly Grey+Silver Stud Earrings. My exact earrings are sold out but they come in a set of two by Sugarfix from Baublebar via Target. This is another similar set by Sugarfix which I love and here is another similar gorgeous set of earrings. I completely straightened my hair out and brushed in on one side - love that it looks a little Hollywood glamour. My favorite item of all though are these Crystal-Embossed Blush Velvet Booties by Who What Wear. These are so beautiful, dressy, well-made and such a steal for 50 bucks though I bought mine when Target was doing a BOGO 50% off which is even better. Go snag these boots for yourself because they are so perfect for the holidays!